(Note: as I write this, Boomer is curled up sleeping next to me on the couch). Well, this may be the most obvious and unsurprising announcement ever, but Eric and I officially caved and adopted Boomer. Two Thursdays ago, Eric took Boomer to the vet and got a full workup – overall checkup, vaccinations, and blood work to check for infectious diseases. We breathed a deep sigh of relief when he came back with a clean bill of health, slapped a collar on him, and officially welcomed him home. And then we gave him a bath. Hahahahahaha he didn’t know what hit him. I don't understand why are you doing this to meeeeeeee? 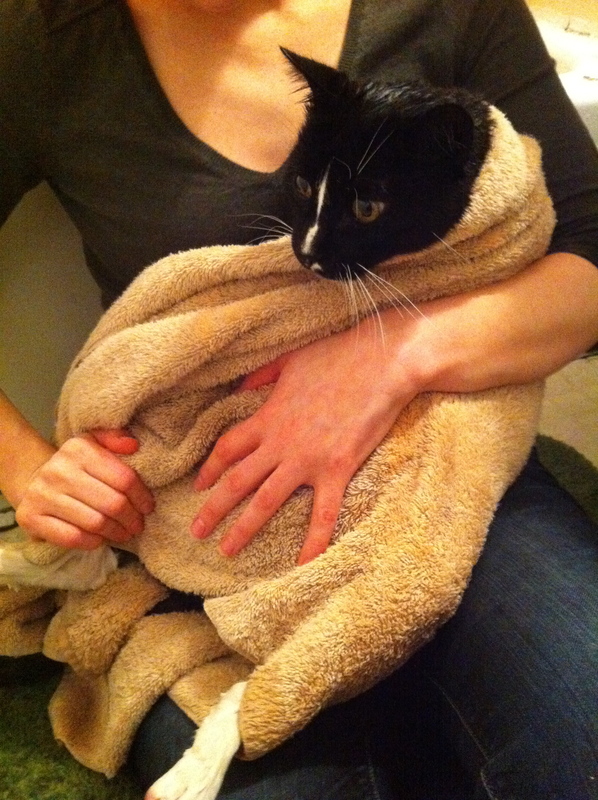 He actually handled the bath pretty well, and only tried jumping out twice (completely soaking Eric and me). 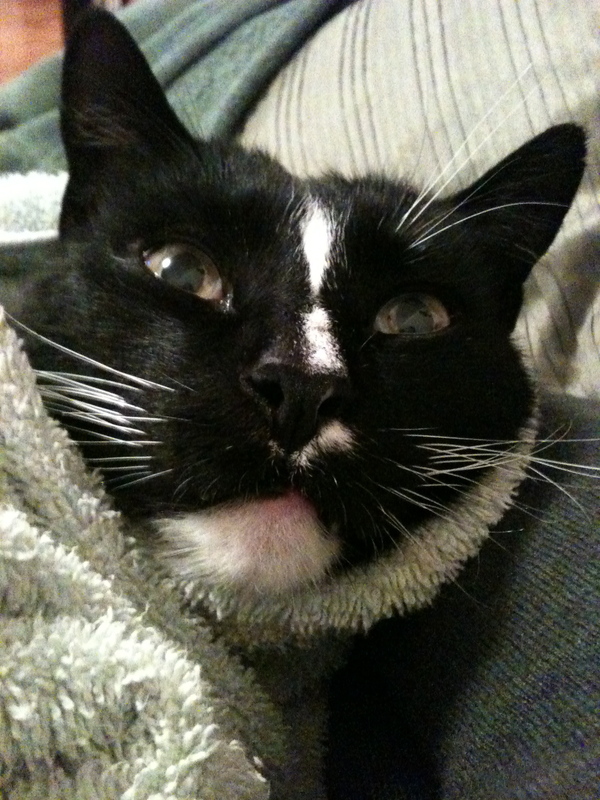 And then I bundled him up in 3 towels and we cuddled on the couch while he licked his wounds groomed himself. 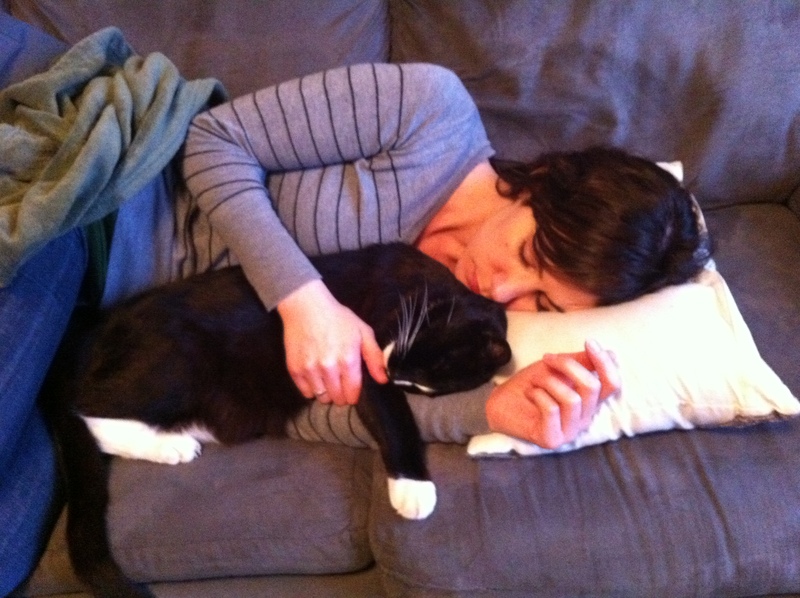 Poor little guy had had a big day – first vet visit since ever(?) and a bath. Well, we hoped that it was all worth it for him when bedtime rolled around and we didn’t have to kick him out in the cold. We weren’t sure where he’d want to sleep and didn’t want to force the cats to be too close too soon (Ella always sleeps with us), so we told him goodnight and left him sprawled out on the couch. Ha – it took less than two minutes for him to trot in, meow a reprimand, and claim his rightful place at the foot of the bed. 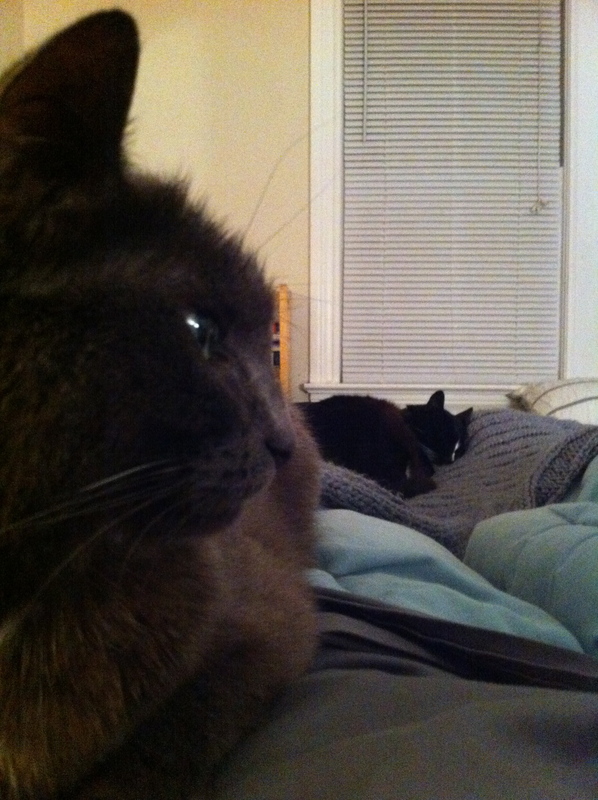 Ella shocked the hell out of me that night by ignoring him. It’s one thing for her to ignore him in the living room, but I fully expected her to lose it if he got in her bed. Color me happy. We’ve been peacefully sleeping like this for the last two weeks. She even ignored him when he walked on her this morning! She was curled up against me under the covers, per usual, and he flat out stepped on her head while climbing out of bed. I can’t believe my little diva stayed put. Speaking of the diva, she’s handling the transition pretty well. Truthfully, it isn’t too much of an adjustment, since Boomer was spending most evenings and weekend days with us. The only difference for Ella is that now he 1) sleeps inside, 2) eats inside, and 3) is still here omg?! She can handle the first one fine, and the second one is usually tolerated, although every once in a while she’ll run up and hiss at him while he’s eating – even if she has the exact same food on her plate. There have been a few moments of why god why where she’ll just randomly swipe at him, but they are lazy swipes and so far no actual cat on cat violence has occurred. 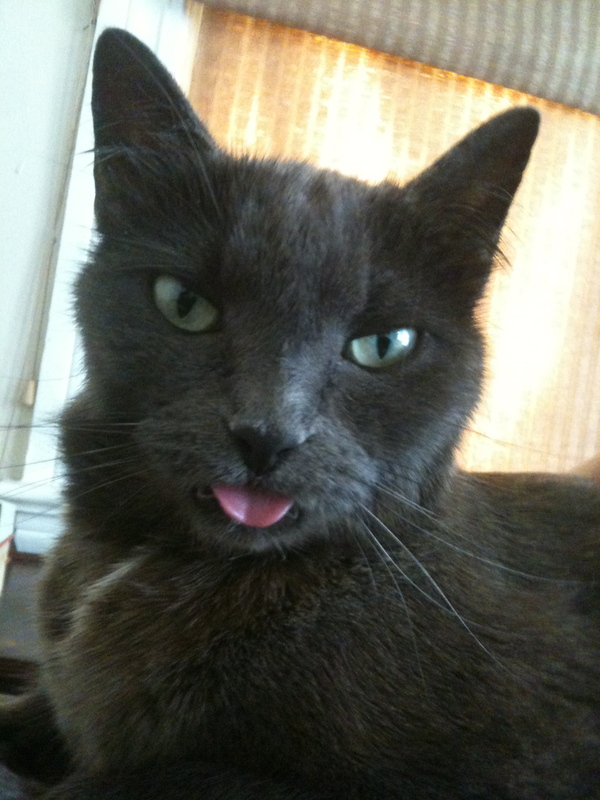 The only hitch in the whole thing is that we haven’t been able to litter box train him. He’s totally housebroken and hasn’t had any accidents, but he views the entire outdoors as his bathroom (typical boy) and hasn’t wanted to use the litter box. On the one hand, this is awesome – who wants another litter box to clean up? On the other hand, it would be really nice if he’d get used to it so we could let him stay in while we’re gone. Although Ella might disagree. Despite that one hang up, we sure have enjoyed our newest official member of the family. He makes a good cuddle buddy after a long day at work. Congrats on your “new” member of the family…. Yay! I knew you’d cave! Congrats on your new fur-baby. HA yeah I should have just admitted it to myself a long time ago – there’s no way I could have said no! Ah bless, what a heart warming little tale. I have a rather large grumpy female cat, Minty or Mint Puss as some might call her, I don’t think she would be anywhere near as amicable as Ella to anyone new that I brought into our small family. sounds promising. Our two brother and sister cats just don’t get along, except just now and again when they seem to confer a bit, eg to demand food or make some mouse’s remaining minutes a concerted reign of terror. Awww hahaha “concerted reign of terror.” Love it. Accurate. Yeah, they seem to be doing pretty well. I tend to fret that Ella isn’t happy, and then Eric reminds me that she is totally fine and oh look she’s sleeping like 3 feet from him and everything is fine. awww what a sweet new nuggie!